Today marks the complete launch of the new IBM Cloud Video viewing experience and the discontinuation of the old experience. This impacts all existing IBM Cloud channel pages that were created before February 18th, 2016, and were not already migrated to the new design. The new viewer experience brings with it a multitude of new improvements for the desktop and mobile experience around these pages. This includes a cleaner look and also additional features for broadcasters to customize channel page content. Want to stay up to date on what changes and improvements are being made to both the channel pages and the overall IBM Cloud Video solutions? Register for this Live Demo: Getting Started with IBM Cloud Video. 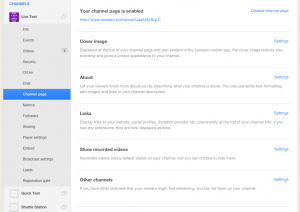 The new viewing experience adds numerous ways to customize a channel page. It offers broadcasters more opportunities to relay their message and provide complementary resources surrounding their broadcasts. Many of these new features are controlled through an expanded Channel Page menu found in the dashboard of a IBM Cloud Video account. 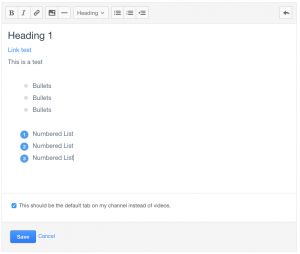 Among these features are the ability to update the cover image, about text, links, video gallery (“show recorded videos”) and setting for the “other channels” feature. We’ll dive into each new feature in terms of the functionality that can be expected and sometimes how to best use it. The new viewing experience offers a much more streamlined and clean looking interface. This includes a similar experience across both desktops and mobile phones or tablets, in contrast to the different design right now across these. The new look utilizes a lot of white in the display, rather than darker, competing background colors. 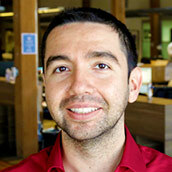 This places greater emphasis on the unique channel page content, such as the video player and information related to the new features that broadcasters can control. One of these major new additions is the cover image for channels. This appears near the top of the channel page, and will function as a backdrop, although with the channel image appearing elevated and on top of the cover image to draw greater attention to it. On mobile the cover image and the channel image appear around the middle of the screen to make room for the player which is at the top of the screen as usual in video apps. Right now, uploaded images must be 2560 x 852 pixels to best accommodate the varying devices with their own resolution. No other image sizes are currently permitted. When you go to the cover image settings you can find the specific safe area within these dimensions that is guaranteed to appear on all screen sizes. The concept of a description or “about” area for channel pages is nothing new. What has changed, though, is the degree of functionality in this area. This includes rich text formatting that introduces the ability to bold, italicize, and use headings. Hyperlinks can also be added, which requires highlighting text and then hitting the link button. Finally, there are also options to add graphics, which have to be hosted outside of IBM Cloud Video, and to add horizontal lines. You can also use numbered and unnumbered lists. There is also an added option to control it so the “about” area is the default choice when the viewer goes to the channel page, as opposed to the video gallery area. The “links” feature found under the “channel page” dashboard allows broadcasters to define URLs that can be linked to. This offers the broadcaster the chance to enter the URL and link text for the name of the link. These links can be edited or deleted at any time. Once enabled, the links appear in the “about” area of the viewing experience. An icon will also populate to the left of each link. The icon graphic will be a link chain, with exceptions including Facebook, Twitter, Instagram, and YouTube pages which have their own logos. Links appear before content entered into the “about” option in the channel page area. Links will be ordered, from left to right, based on when they were added to the “links” area. If the broadcaster needs to add a new link that should appear at the front, it’s recommended to simply edit the first link and replace it with the new URL. The replaced link could then be added as a new link, and would appear at the bottom. Broadcasters can add a video gallery to their channel page that will feature their uploaded VOD (video on demand) content. The gallery will show a thumbnail to represent the content, title of the video, how long ago it was uploaded, and total views the video asset has received. Control wise, this feature is found under the channel page that is not set to “unpublished” where it can be enabled or disabled. Be aware that when used, all video content associated with the channel will be listed here. As previously mentioned, the video gallery is the default landing area for the viewer, unless an option is enabled to make the “about” area the default. Events on IBM Cloud Video give broadcasters a powerful way to inform their viewership of upcoming broadcasts. 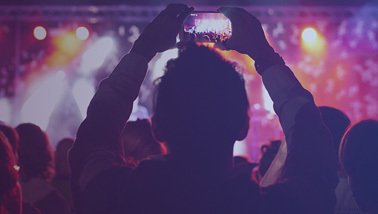 Not every broadcaster does 24/7 streaming, and letting viewers know when they can expect the next live stream can bolster both your audience size and also viewer retention for future streaming. This feature adds an “upcoming” area to the channel page that viewers can select to see a list of events. This provides the dates they will occur on, time of day, title of the event and an option to “remind me” of when the event will occur. The remind feature can be linked either through a Facebook account or through a IBM Cloud Video account to send notifications to the viewer. As a side note, there is no “on/off” switch for this feature as unlike others it’s not controlled from the “channel page” settings. So if events are scheduled, the “upcoming” area will populate with them. One of the goals of this update is to help broadcasters better own their IBM Cloud Video viewing experience. One approach toward achieving this is through the introduction of the “other channels” feature. Parallel to the “about” and “video gallery”, viewers can select the “other channels” option to see a list of other channels from that broadcaster. Being able to select channels for this area is fairly robust. It’s controlled through entering the IBM Cloud Video channel page URL. Because of this, users can even enter in channels from other broadcasters as well. This can allow synergy, from a simple “channel exchange” with others to being able to list channels from other departments under a single company. The current viewing experience has been around for years, with no significant upgrades to the design. This resulted in the experience not evolving with industry trends and not providing the experience desired at IBM Cloud Video to best utilize features such as the ability to create galleries of video content. Updating the experience presented its own challenges. Not only did the new design have to work over desktop and mobiles, but it also had to accommodate the over 1 million customers utilizing the portal as well. Consequently, updating the design was broken into stages. Stage one started on December 16th, 2015, and offered users the chance to preview the design using their own content, barring it wasn’t password protected or had the channel page disabled. This offered a valuable opportunity for users to present feedback before committing to elements of the redesign. Stage two started a slow rollout that began on February 18th, 2016. This allowed broadcasters the opportunity to migrate early to the new design and also marked the point when all newly created channel pages would automatically be with the new viewing experience. Stage three is today, and sees all channel pages converted over to the new design. 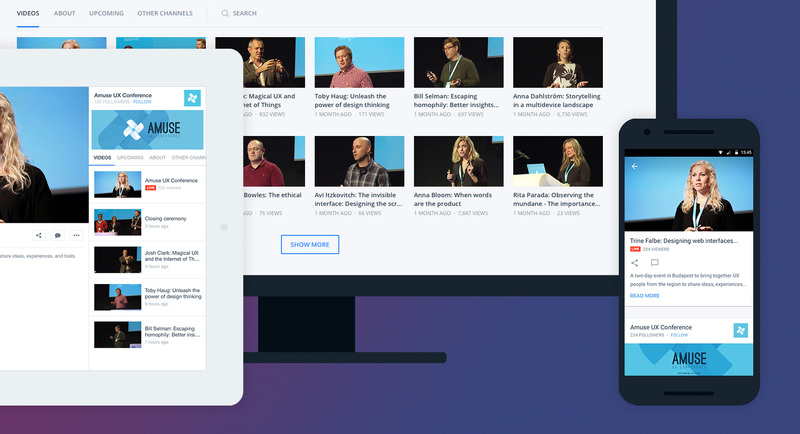 Many months in the making, the new viewing experience is now available on all IBM Cloud Video channel pages, offering a clean, unified look that introduces more features for broadcasters to utilize. Please note that although channel pages are similar across both Streaming Manager and Streaming Manager for Enterprise, the latter also include a restricted access portal as well, which combines channel pages into a gated experience. For those curious on these portals and overall strategies on internal comms, download this Using Video for Internal Corporate Communications, Training & Compliance white paper.